Do any of you remember the cute stamp set, Ahoy Matey? When it came out, my daughter, Sarah, who was an adult at the time, fell in love with the set. She informed me that every card I make for her for the rest of her life should be made with this set. Of course, I deviated in my choice of stamps I used in cards for her over the years. But, occasionally I recall her request and drag the little pirate out again for another encore. I've used him a few times over the years, but only once since I've been blogging. The occasion for using the set most recently was when she joined the U.S. Army. After her deployment to Afghanistan, and her return home, I resurrected the card I had made for her awhile back. You can see it here: http://www.paperseedlings.com/2012/12/welcome-home.html. I love the pirate's camo outfit. Scroll ahead to the present. Yesterday, Sarah had a birthday. 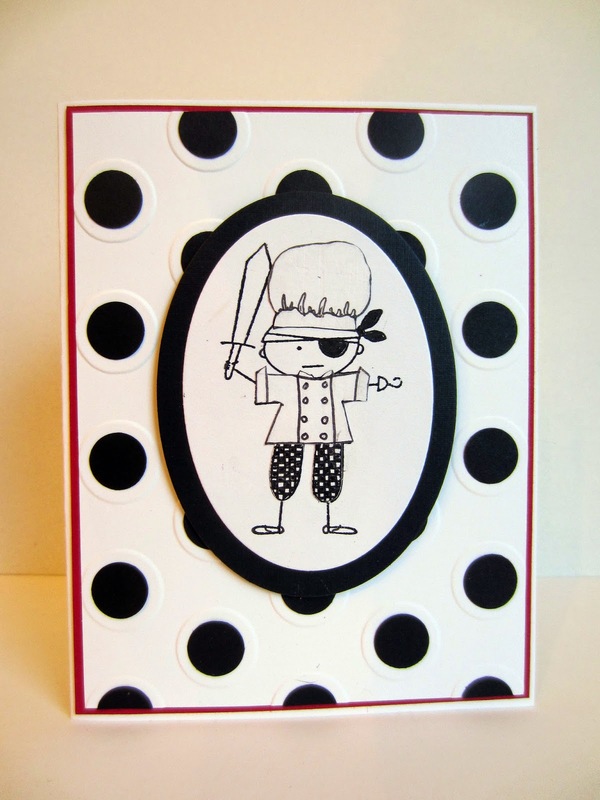 I thought it would be fun to create her birthday card using the Ahoy Matey pirate. While she was still stationed in Washington, she began taking culinary classes. Now, that she is out of the Army, she is continuing her culinary schooling. The students have to dress the part of a chef during all their hands-on classes. 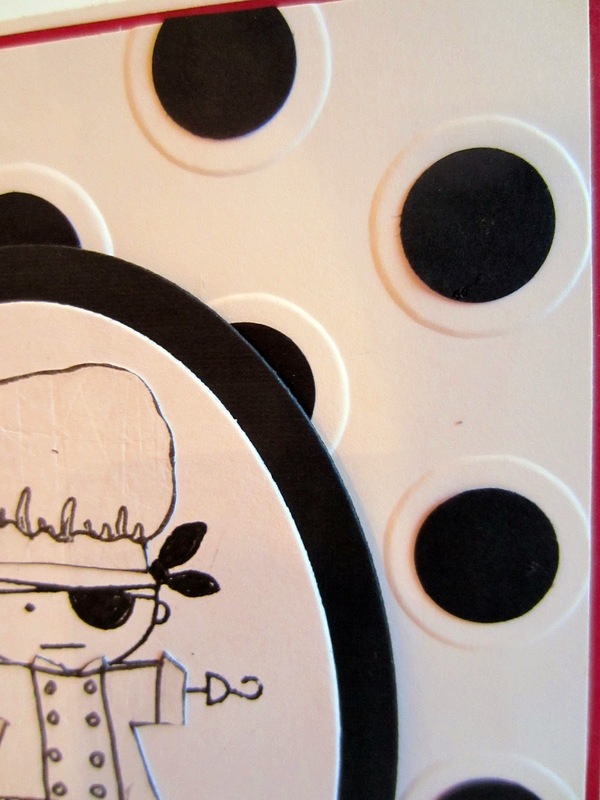 I made little patterns from the clothes the pirate was wearing in the original stamp. Using these patterns, I recreated the pieces into chef's attire. Inside the card, I included the pirate bird from the set. Of course, he needed to match his master, so I made his wings and tail in the same checkerboard as the chef's fancy pants. 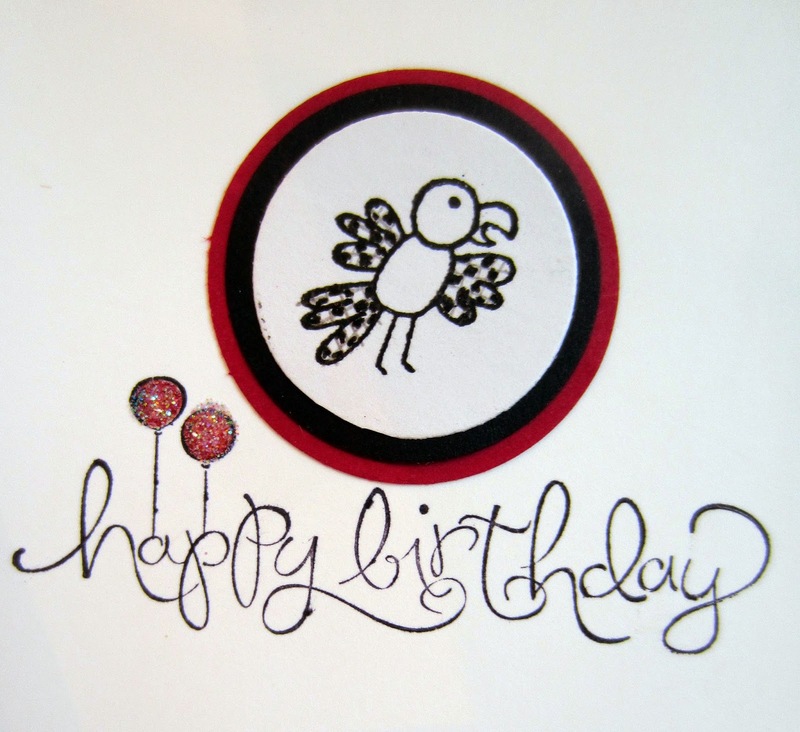 For the background, I had used the Large Polka Dot embossing folder. While I love the look of the huge clean polka dots on the crisp white background, I thought it needed just a bit more "punch". So I punched 1/2" circles from black paper, and added them to the center of each of the raised dots. I think her mail must be taking a little trip around the country, because when I talked to her last night, he still hadn't arrived to relay his own personal birthday wishes. I hope she likes him when he finally shows up. Do you own any stamp sets that you continue to go back to time after time after time? Share with us some examples and why the stamp set(s) appeal to you! That is such a cute card! I love how you re-did the stamps to work. How sweet you have made this pirate stamp fit into the different stages of your daughter's life and career. The chef and his bird pal are adorable. Maybe they went off on an adventure before giving your daughter her birthday wishes. Thank you for sharing the card with us at Make It Monday. So adorable! LOL Made me smile! Love it! So cute! Thanks for linking up at Show Me Saturday. Hope to see you there again this week! 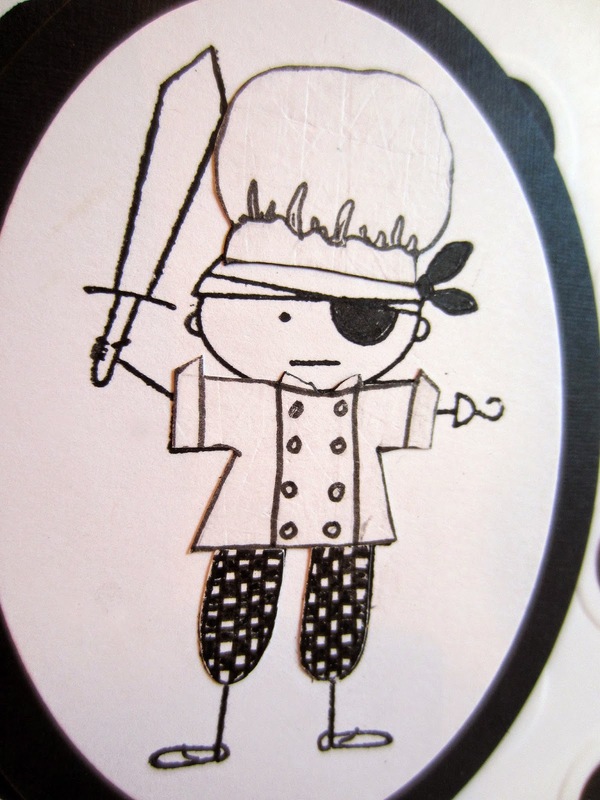 This pirate chef is so cute! Thanks for sharing with us at Your Designs This Time!